It might not have been the most polished or nuanced; but it was certainly the most honest and most passionate debate we’ve yet seen – or are likely to see – in this election. 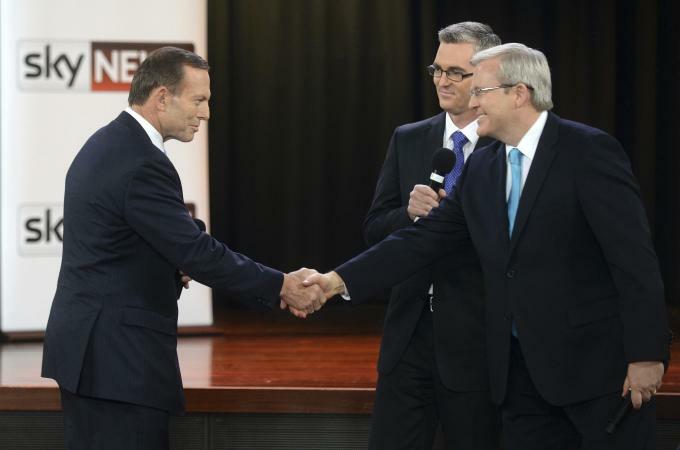 Leaders’ Debate 11/8/13 – style, not substance? Last night’s Leaders’ Debate should have been an opportunity to hear the candidates being closely questioned. It should have been a chance to have policies put up directly against each other. It should have been a moment where hard questions were put, and pressure kept up to force Prime Minister Kevin Rudd and Opposition Leader Tony Abbott to actually provide some answers. It wasn’t. The debate was disappointing, at best – and not just because the questions were clearly given to the candidates long beforehand. There were at least two clear ‘gifts’, one for each candidate – in Parliament, they’d be called Dixers – and the last question was almost served up on a platter to allow a policy announcement. I’m only going to look at a couple of significant moments from the question and answer period, however, because I want to focus on the commentators, post-debate. Generally, Abbott’s answers tended to be either riddled with slogans, or entirely composed of criticism of Labor. At one point, he referred to Labor’s policies as ‘waffle’, and at another, laughed derisively during Rudd’s answer. Rudd, as sitting Prime Minister, had the advantage of being able to base his answers on the government’s achievements, and go on to talk up new policies. There were few surprises, policy-wise, but it’s rare to see major announcements during a debate. Rudd stumbled badly on the question of whether a Labor government would build a second airport for Sydney. 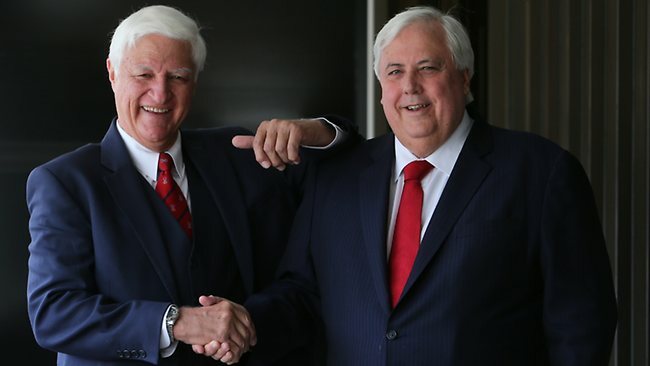 Although his answer was essentially the same as Abbott’s – ‘we’ll have a look at that with some experts’ – he failed to point the finger at either the former Howard government or New South Wales Premier Barry O’Farrell. He could have said that earthworks were actually in progress, stopped by Howard. He could have said that O’Farrell had absolutely refused to work with federal Labor. It’s anyone’s guess why he didn’t, but then he compounded the error by pointing out that there were infrastructure needs right across the country. No one likes to hear that their needs might be less important, no matter how true that may be. For his part, Abbott came a cropper on the issue of aged care. The Coalition’s ‘Real Solutions’ booklet has a vague paragraph promising an ‘agreement’ with providers in the sector. Pressed for detail on actual policy, Abbott had nothing to add. In fact, he grudgingly admitted he would keep the reforms passed under Labor. Abbott also ruled out any changes to the GST – but was unable to answer why, in that case, the GST would be part of his promised tax review. He also tried to say that any change to the GST would have to involve the agreement of all States and Territories, and therefore unlikely even if he were looking at that. Speers pulled him up immediately for that piece of misinformation. A sitting government has the ability to change the current legislation, without undertaking any consultation. But it was the last question, leaked some time earlier, that drove the biggest wedge between the leaders – that of marriage equality. The two answers could not have been more different. For Abbott, the issue was settled last term. Besides, there were much more important things. Effectively, the Coalition considered marriage equality a dead, second-order (at best) issue. Abbott did offer a sop at the conclusion of his answer, suggesting that the party room might look at the situation if anything changed. He certainly gave the impression, though, that it wasn’t worth holding your breath. Rudd reiterated his change of heart, and commitment to marriage equality, calling it a ‘mark of decency’. Then came the election promise. Within the first 100 days of a Labor government, they would introduce legislation removing the impediments within the Marriage Act, and allow a conscience vote. It’s still highly unlikely that such a bill would pass, given the Coalition’s stance, but – unlike Labor’s former position – this would be a bill introduced by a Minister and backed by the Prime Minister. Such things carry their own weight and, while Labor would still have to deal with its own Right faction’s opposition, it gives them a stronger base from which to begin. Fairly decisive, you’d think. With one exception, every poll gave the debate to Rudd. The ABC’s poll, conducted via Twitter, could rightly be set aside as have a particularly limited audience – but even without that, on balance Rudd won the debate. But then there were the commentators, who, almost as though they were working from the same script, gave the debate to Abbott. This was particularly startling in the case of the ABC, who published the results of their own polls, then proceeded to completely ignore them. And why did Abbott ‘win’? Because Rudd ‘started off nervously’. Because – you have to love the vagueness of this – Abbott ‘looked Prime Ministerial’. Finally – and this was the point where credibility went out the window – no less a personage than Laurie Oakes asserted that Abbott had won, not in spite of his reliance on three word slogans, but because of them. Because, apparently, the essential qualities in judging whether someone is a good debater have nothing to do with the substance of their arguments. Or how well they refute their opponent’s points. No, no. It’s all about style. Oscar Wilde observed that those who used the phrase ‘style over substance’ was a marvellous and instant indicator of a fool. Now, call me the product of a bygone generation, but when I was at school, we were taught that debates are won on the quality of your argument. We were taught how to construct initial statements, build on those, and to rebut and dismantle our opponents’ arguments. We were assessed on those criteria, and the winner was whoever could do that better. Call me a wide-eyed optimist, but I thought that was still how we determined who won our debates. Oh, silly me. I keep forgetting that modern political reporting has less to do with issues of substance and more to do with whether Kevin Rudd’s hair was mussed up by the wind or Julia Gillard’s shoes sank into the lawn. It’s about whether the person in front of the cameras grabs attention with some snappy talking points, not whether they’re actually saying something of significance. Think I’m exaggerating? Go take a look. The number one story to come out of last night’s debate is whether Rudd broke the rules by taking notes to the podium with him. And whether Abbott, lauded as being ‘note-free’, might also have had notes, as claimed by Lindsay Coombs, who tweeted a screen-grab showing notes on Abbott’s podium. So this is where we are. What should have been a way for us to learn more about the policies of the new major parties, vigorously debated, analysed at length with the precision that comes from long experience in political journalism – was a farce. Commentators ignored clear poll results, dismissed substance in favour of style, and focused on the existence of a few typed pages. And today, those same commentators complain that last night’s debate was boring, and that no one will want to watch any others. How ‘lucky’, they said, that Channels Nine and Ten had secondary (read: less popular) channels to carry the broadcast. I suggest that perhaps those commentators might better use their skills as judges on ‘Australia’s Got Talent’, or similar shows. Meanwhile, perhaps we could have a real debate – and get some real analysis, while we at it.